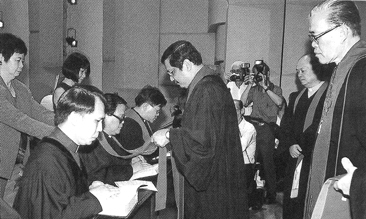 Bishop Dr Solomon putting a stole around the neck of the Rev Ho Yu Choy, with Mrs Ho behind him. The other two pastors kneeling are the Rev David Koh Ah Chye (nearest camera) and the Rev Alex Chng Peng Lian (background). 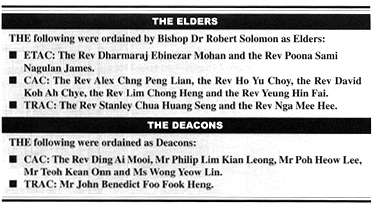 They were three of the five CAC pastors ordained as Elders. Looking on are Bishop Emeritus Wong Kiam Thau (right) and the Rev See Ping Eik (right, background), Pastor-in-Charge of Telok Ayer Chinese Methodist Church. 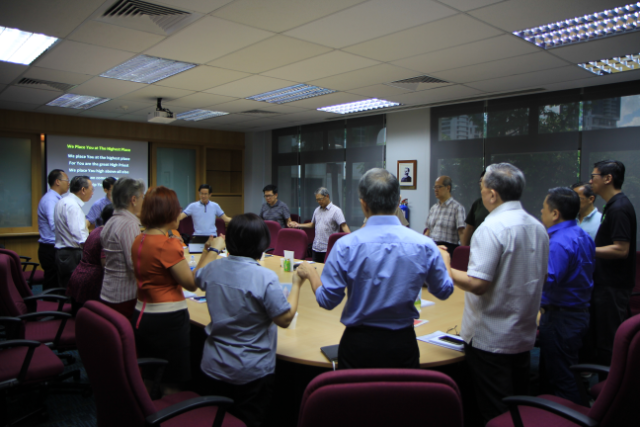 -- Chinese Annual Conference picture by BILLY KON of Bukit Panjang Methodist Church. BISHOP Dr Robert Solomon has reminded his fellow pastors of the special nature of their calling. He was preaching at the Ordination Services of Emmanuel Tamil Annual Conference (ETAC), the Chinese Annual Conference (CAC) and Trinity Annual Conference (TRAC) in November at their respective Annual Conferences. In the first place, he said, the calling was in obedience to Jesus’ command to “Follow me”. For Peter, there were four occasions when this command was made. At first, he was to follow his Master part-time; a second invitation made Peter a full-time follower; but the third and fourth invitations elicited a life-time commitment. So, the ordained minister must follow Jesus’ example as the Great and Good Shepherd — an under-shepherd following Jesus as his pastoral model. Next, he must be prepared to undergo the searching question which Simon Peter faced — “Simon, do you love me?” to test the depth of his commitment. Jesus used the word agape, denoting a divine, sacrificial and deep love. Peter, unable to commit himself to that level, replied, “I phileo you” – denoting a lower form of love. In the third and final question, Jesus understood and accepted Peter’s use of phileo as an honest appreciation of himself. Perhaps this was what St Bernard of Clairvaux, a 12th Century monk, meant in the third of his four stages of loving God – loving God for God’s sake, rather than loving ourselves, or loving Him for our sake. Finally, the ordained elder is called to “Feed my sheep”. The ordained ministry is a ministry of the Word, preaching the Bible, and the ministry of the table, the holy sacrament. They are symbolised by the Bible and stole presented to ordinands. Said Bishop Dr Solomon: “To be true to Jesus’ command to ‘feed my sheep’, however, is to remember that no church belongs to any pastor: every church belongs to Jesus. For the sheep, the importance of the ministry of preaching is such that pastors must soak themselves in God’s Word, to pray and prepare their sermons well, so that when they stand at the pulpit, they truly have a word from God. 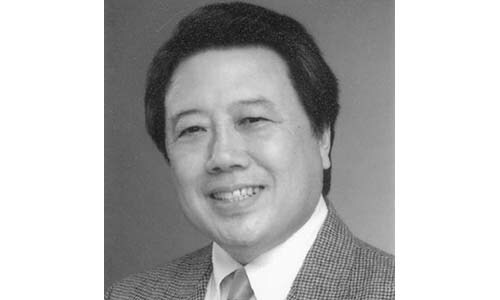 Earnest Lau is the Associate Editor of Methodist Message.